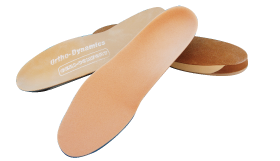 This accommodative orthotic group consists of five (5) leather orthotics and five (5) specialty orthotics that provide maximum shock absorption with control level ranges from semi-rigid to flexible. 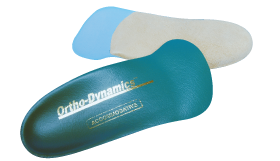 All orthotics are covered with 1/8 poron and 1/16 or 1/8 plastazode to address loss of fat pad, bony prominences and plantar lesions associated with less active patients and diabetics. 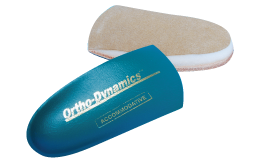 Activity: Flexible to semi-flexible control, protection and comfort for diabetic or older less active patients with loss of fat pad. Components: Offered in 2mm or 3mm subortholene shell. Shell top covered with layer of 1/8 poron and 1/8 plastazode and full length felt protective undercover. Available in met, sulcus or full length. Footwear: Diabetic shoes or athletic walking type shoes. Activity: Provides moderate control and comfort. Components: Two (2) shoulder leathers laminated together. Intrinsic posting to keep bulk low. Leather shell top covered with layer of 1/8 poron for comfort and suede undercover. Available in met, sulcus or full length. Footwear: Full depth dress shoes, diabetic shoes or athletic footwear. Components: Leather shell laminated to a 2mm subortholene shell to provide maximum low bulk. Intrinsic rear foot posting. Shell top covered with layer of 1/8 poron for comfort and suede undercover. Available in met, sulcus or full length. Footwear: Low dress shoes, diabetic shoes, athletic footwear, full depth loafers or slip-ons. 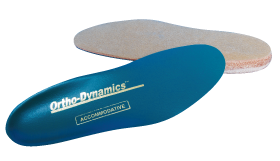 Activity: Accommodative flexible control with maximum shock absorption. Components: Leather shell with open cell sponge rear foot posting and arch filler. Shell top covered with layer of 1/8 poron for comfort and full length felt protective undercover. Available in met, sulcus or full length. Footwear: Lace shoes, athletic footwear or walking shoes. 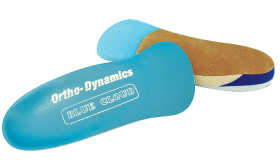 Activity: Semi-flexible control with maximum shock absorption for diabetic or less active patients. Components: Leather shell with (firm) plastazode rear foot posting and arch filler. Shell covered with layer of 1/8 poron for comfort and full length felt protective undercover. Available in met, sulcus or full length. Footwear: Lace shoes or athletic walking type shoes. 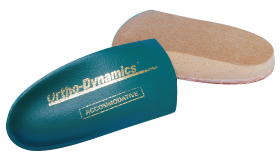 Activity: Semi-Rigid control and stability with maximum shock absorption. Components: Leather shell with (firm) cork rear foot posting and arch filler. Shell top covered with layer of 1/8 poron for comfort and full length felt protective undercover. Activity: Semi-rigid to rigid control with maximum shock absorption. Designed for overweight less active or diabetic patients requiring more support. Components: Offered in 3mm or 4mm polypropylene shell. Extrinsic 55 durameter rear foot post and open cell sponge arch filler. Shell top covered with layer of 1/8 poron for comfort and full protective felt undercover. Available in met, sulcus or full length. 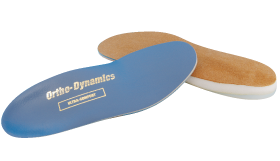 Activity: Semi-flexible to moderate control with maximum shock absorption for diabetic custom insole. Designed for diabetics or less active patients. 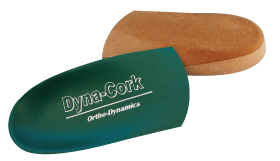 Components: Firm cork shell with cork extrinsic rear foot post and arch filler. Shell top covered with poron and plastazode and full length felt protective undercover. Available in met, sulcus or full length. Activity: Semi-flexible control for diabetics or less active patients. Components: Offered in 3mm subortholene shell. Firm plastazode rear foot post and arch filler. Shell top covered with layer of 1/16 poron and 1/8 plastazode and full length felt protective undercover. Available in met, sulcus or full length.